Strong, reliable and reusable – the ideal container for distribution and supply centers. Maximum load stability provided by recessed lids. Ergonomic handles for easy lifting. Molded from high-density, FDA-approved polyethylene. Stacking strength and security from tops attached with interlocking hinges. Smooth conveying thanks to the textured, non-slip bottom. Protects contents from dust and damage with securely-closing lids. Stacks when full, nests when empty. Padlock eye for optional fastening and/or locking of lids (padlock not included). Outside Dimensions (Top L x W) - 21-3/4"x15". Outside Dimensions (Bottom L x W) - 18-9/16"x12-5/8". Inside Dimensions (Top L x W) - 19-3/4"x14". Inside Dimensions (Bottom L x W) - 18"x12-1/4". 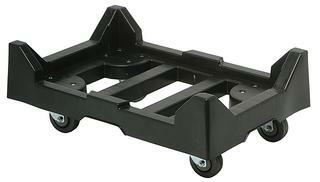 Optional Plastic Dolly for transporting your containers is also available – please see Options tab for details. Custom colors and hot stamping are also available – please call Material Flow for details. Attaches securely for easy part identification. Sold in cartons of twenty-four. Use with Attached Top Containers QDC2420-12 and QDC2820-15. Use with Heavy-Duty Straight Wall Stacking Container RSO2422-11. Padded with black rubber trim.